Cannot be destroyed by battle or by card effects. If you take damage from an attack involving this card, or from an opponent's card effect: This card gains ATK equal to the damage you took. The name Beelze is a reference to Beelzebub, the Lord of Flies. The central area of the body of this monster resembles the head of a fly (the typical representation of the head of Beelzebub), and this monster is played by Sect, who uses an Insect Deck. In the manga, the humanoid shown between this card's two heads is revealed to be female. This is at odds with its OCG name, Devil King Dragon - Beelze. This monster has an evolved form, Beelzeus of the Diabolic Dragons, thus making this the first Duel Dragon to have an upgrade/evolution. This card resembles Arcana Force EX - The Light Ruler. This card's OCG/TCG artwork is taken from Yu-Gi-Oh! 5D's Ride 20: Shadow Card!! specifically from the panel showing this monster attacking Celestial Wolf Lord, Blue Sirius. 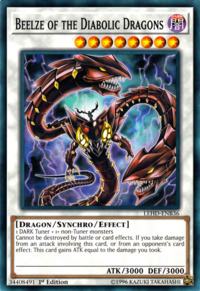 The ATK gained by this card's effect remains increased as long as this card remains face-up on the field.